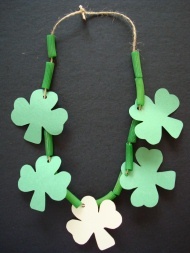 this Lucky Charm Necklace. It's a fun and easy St Patricks Day craft for older toddlers, preschoolers and kindergarteners, and it also helps develop those fine motor skills! 1. Mix 1 teaspoon of water with 6 drops of green food coloring in a zipper baggie. Add 1/2 cup macaroni, seal the baggie and squish it around until the pasta is well coated. Spread onto a piece of wax paper to dry. It will take 1/2 hour to an hour for your macaroni to be dry and ready to use depending on your climate (easy to make ahead of time). 2. Cut out some small shamrocks. Cookie cutters make great templates to trace around, or search google images to find your own. Punch holes in the tops of each shamrock. If you don't have a hole punch you can always use a pencil or pen to punch a hole through! 3. String your macaroni and shamrocks on to your yarn. Don't forget, it's much easier for children to string things when your wrap a piece of masking tape around the end of the yarn! When you've finished stringing, tie the ends together!